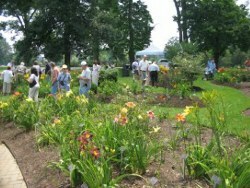 The MCDS dedication ceremony for the Ohio Daylily Hybridizers’ Garden was held on July 9, 2006 during the MCDS Daylily Show at Franklin Park Conservatory. In 2006, the garden was approved as an official AHS Display Garden. Franklin Park has been an important Columbus, Ohio feature since 1852. In its history it has been a county and state fairground, a public park, a temporary zoo, a popular site for weddings and community events, and the site of the 1992 Ameriflora exposition. The beautiful Conservatory, originally dedicated in 1895, had been enlarged, and displays from many countries around the world graced the grounds. The 1992 AHS convention met in Columbus that summer, and attendees visited the daylily garden created by Metropolitan Columbus Daylily Society volunteers for that 7-month long exposition. 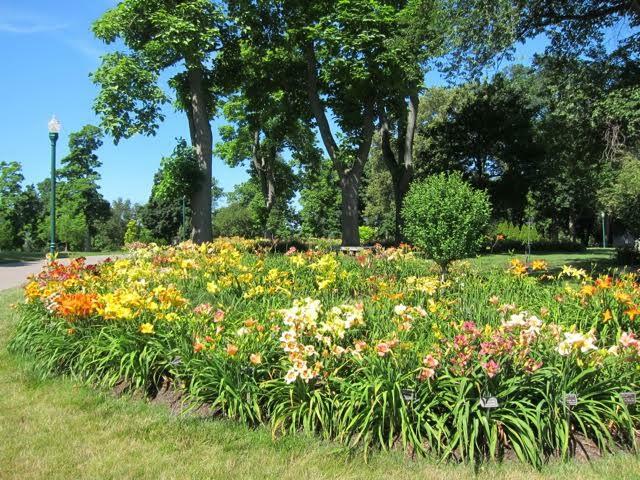 Although that first garden was dismantled in 1999, the concept of developing a showcase for historic daylily cultivars hybridized by Ohioans was renewed when the society celebrated its 20th anniversary in 2005. In a partnership with the Franklin Park Conservatory, MCDS volunteers began planting Ohio-bred cultivars from the 1920s through the 2000s in five beds adjacent to the Tour Bus Entrance. In the first year 159 cultivars were donated to the project, and it became an AHS Historic Daylily Display Garden in 2006. 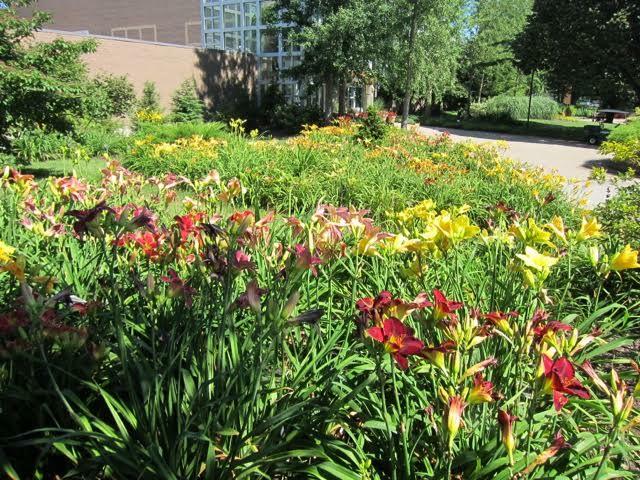 Noting how well the daylilies flourished after only one year, hybridizers and members from other daylily societies began donating their favorites, and the project grew far beyond original expectations. When the tour buses arrive at the Conservatory on July 13-14, 2012, attendees of the AHS national convention will see 15 beds with over 700 registered cultivars from 80 Ohio hybridizers. 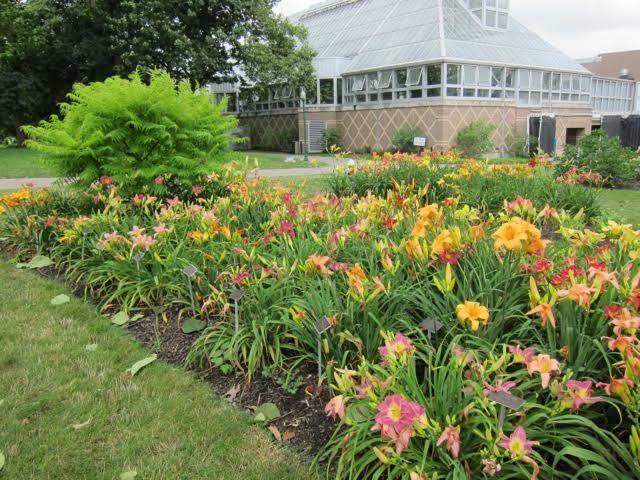 Besides that, the garden showcases an entire Stout collection, a collection of species daylilies, plus early hybrids including Hemerocallis ‘Apricot’ (Yeld, 1893) and 22 early 20th century cultivars. Many will gravitate to the AHS Award-winners beds and stunning recent introductions from well-known Ohio hybridizers Jamie Gossard, Dan Bachman, Richard Norris, Curt Hanson, Steve Moldovan, and others. However, the concept promoted by MCDS coordinators Alan Hersh and Karen Ciula from the beginning was to encourage every Ohioan hybridizing and registering a daylily to be recognized in the collection. Since 2005 Alan and Karen have found back yard pollen dabbers who named their creations for friends, relatives, and mentors. Some will happily register only a few while others may go on to become well known and mentors to future hybridizers. We want to introduce 13 new Ohio hybridizers and their flowers registered after 2005. One such hybridizer was Shirley Farmer, who founded the Midwest Hybridizers Group in the Dayton, Ohio area and mentored many others but did not register any of her own seedlings. Shirley’s toothy H. ‘Shabby Chic’ (Farmer-Stegall, 2010) was registered posthumously. Shirley mentored Bob Faulkner, who hybridized for 15 years before registering H. ‘Dr Jules Michael Vinkman (Faulkner, 2007). Steve Moldovan’s influence on the work of Mike and Sandy Holmes indirectly led to the work of Kim McCutcheon, who has registered 22 daylilies since 2009, including H. ‘Tornado Chaser’ (McCutcheon, 2009). In Central Ohio Jamie Gossard has mentored many of the MCDS members, including Jane Saliaris and Gerald Bushong, whose seedling collections can be seen in Jamie’s Heavenly Gardens on next year’s tour. 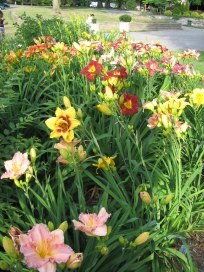 Jane has registered 2 daylilies to date, H. ‘Bronzed Apollo’ (Saliaris, 2007) and ‘Emerald Pinwheel’ (Saliaris, 2010). Ten of Gerald’s 33 introductions are in our garden, including H. ‘Wonderous Dreams’ (Bushong, 2010). 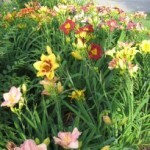 Brian Burley, previously a rose hybridizer, has registered 3 daylilies, including H. ‘Dazzling Debbie’ (Burley, 2011). Steve Williams honors one of the MCDS founders Bernie Grebus with H. ‘Bernie’s Fault’ (Williams-S, 2009). Cindy Osman, whose garden will also be on the tour, has one registration H. ‘Nova Jane’ (Osman, 2010), and her mother Bonnie Singer registered H. ‘Grammy’s Little Noah’ (Singer, 2010) for her grandson. Northern Ohio’s new hybrids include John Hric’s H. ‘Walking the Pattern’ (Hric, 2011), Dave Winter’s H. ‘Noe Claire’ (Winter, 2010), Sara Knackstedt’s H. ‘Merry Marnie’ (Knackstedt, 2010), and Amber Strope-Ward’s H. ‘Dancing in a Pink Dress’ (Bachman- Strope, 2008). 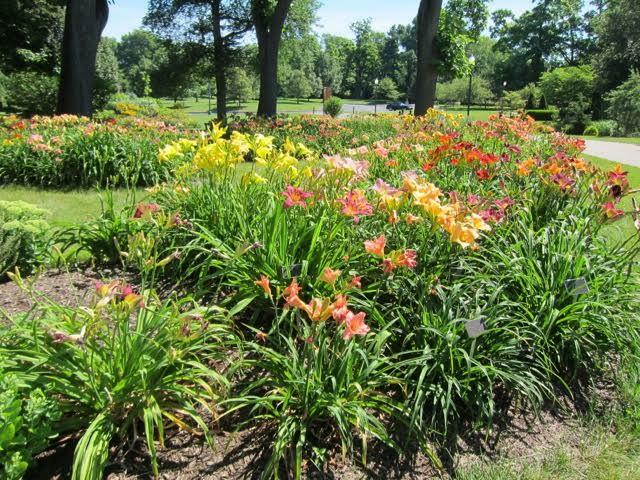 The Ohio Hybridizers Historic Daylily Gardens came about much in the same way as described in LaVere Webster’s article “A Living Library” in the Fall 2011 Daylily Journal. 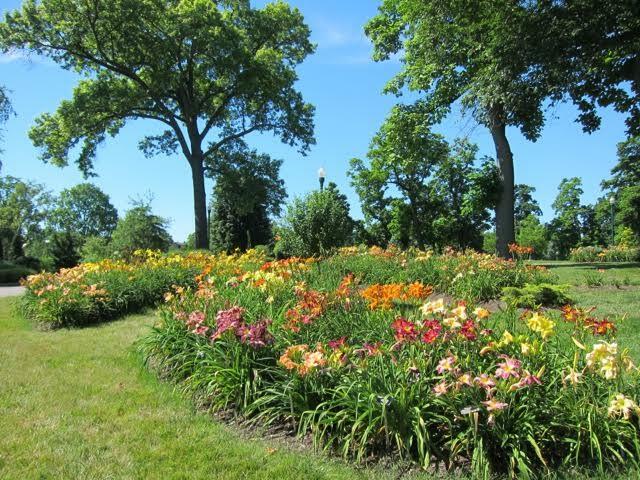 Just as the Troy, Michigan historic garden was created for the 2002 AHS National Convention, the concept for the Ohio Hybridizers Garden germinated in the spring of 2005 to celebrate an event, the 20th anniversary of the Metropolitan Columbus Daylily Society. Historic events often spark enthusiasm for something new and exciting. 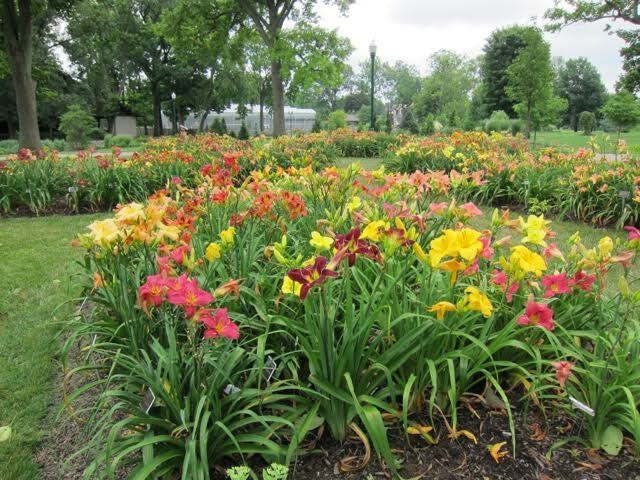 Back in 1992 volunteers from MCDS collaborated with Oakes Daylilies in Tennessee to develop a display of modern daylilies for the Ameriflora Exposition at Franklin Park in Columbus, Ohio. 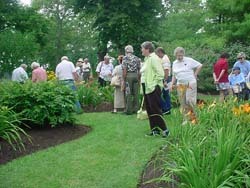 The Region 2 Summer Meeting also met in Columbus that July, and 168 attendees toured the gardens. After Ameriflora, interest in gardening and landscaping exploded in central Ohio, and MCDS membership grew ten- fold over the decade of the 1990s. That original daylily garden was phased out in 1999, but the dream didn’t die. One of the most important requirements for a group wishing to develop a historic garden is to have a good working relationship with a public facility. MCDS has been blessed by its partnership with Franklin Park Conservatory. 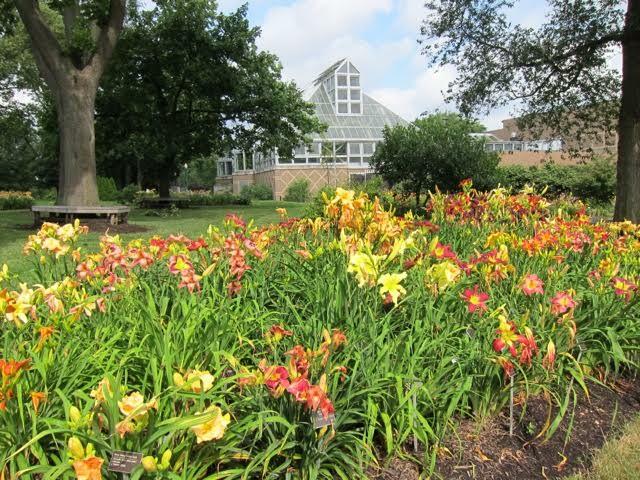 Since the mid-1990s, we have held meetings and daylily shows at the Conservatory, made annual cash contributions, provided volunteers to maintain our daylily collection, and donated divisions of the latest plants. Twice a year MCDS purchases a collection of new cultivars and distributes them in a drawing to members who have been with us for at least a year and who promise to provide the best care of the plant for three years. At that time the member keeps one fan and returns the remainder for the auction. For many years a portion of the returning plants was donated to either Inniswood Gardens in Westerville, Ohio or to the Conservatory. We believe in being generous to our partners! Then a most fortunate event took shape. In 2000 Franklin Park Conservatory and the Columbus Recreation and Parks Department developed an elaborate landscape Master Plan for the 88-acre park. With the local economy rolling, millions of dollars were pledged to enlarge the historic Victorian Palm House, creating facilities for weddings, the Brides’ Garden, Asian and Mediterranean rooftop gardens, a production greenhouse, a 4-acre Community Garden Campus, and what they termed “small garden vignettes” for affiliate plant societies. 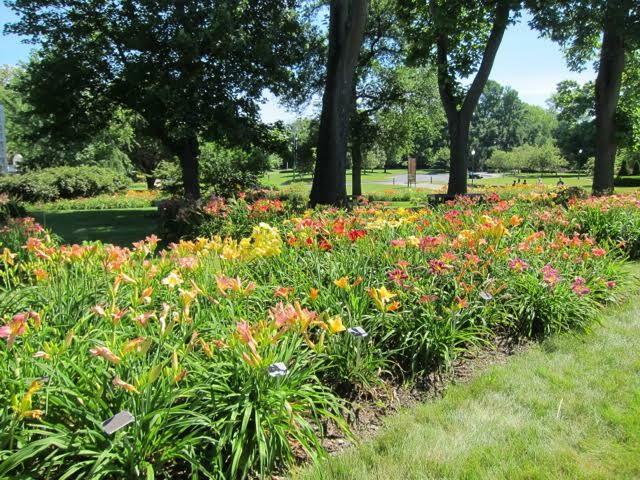 By 2005 projects were underway in the newly named Franklin Park Conservatory and Botanical Gardens, and our new Ohio Hybridizers Daylily Garden became a reality. 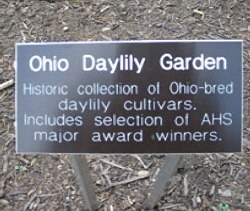 The original concept developed by Alan Hersh and I was to collect representative cultivars from as many historic and current Ohio hybridizers listed in the AHS registration records as could be found, to encourage new hybridizers to register their plants, and to educate the public by showcasing Ohio’s AHS award-winning cultivars. Naively, we planned to collect only 150 cultivars for three beds arranged by decade and two for our special historic collections. MCDS members and the Conservatory staff were enthused, beds were designed, and donations rolled in. Another milestone occurred on Saturday evening, July 2, 2005. Alan and Joyce Hersh, Charles and Cynthia Lucius, Bill and Gail Johannes, and I were attending the banquet at the Cincinnati AHS Convention. Some glasses of wine were involved. 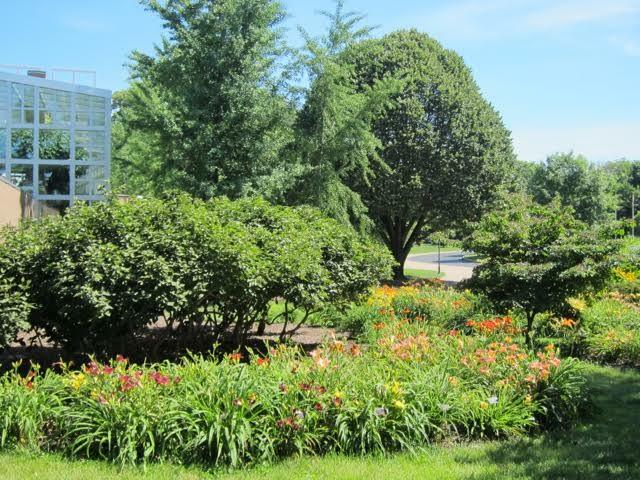 We were bragging about our beautiful gardens back in Columbus when someone said, “You know, we are the biggest club in the country and have a gorgeous garden started—we ought to host a convention.” As many other convention organizers could also attest—what were we thinking! Nevertheless, the die was cast. 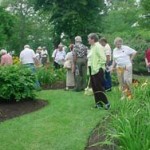 By July 2006 we had planted our 150 cultivars, and the newly designated AHS Historic Daylily Display Garden was dedicated. But now, we were setting sail into a convention plan with Charles and Cynthia Lucius at the helm. America will rediscover Columbus in 2012! The beauty of collecting daylilies in Ohio lies in its wealth of people who contribute to our gardening heritage. Alan Hersh identified over 70 hybridizers by searching AHS registration records. With that list in hand, we hit the road, collecting donations from members of societies all over Ohio. Plants also arrived from Minnesota, Michigan, Pennsylvania, Massachusetts, North Dakota, and North Carolina. It was remarkably easy. Daylily people are so generous, and our local hybridizers showered us with introductions to display in our new gardens. 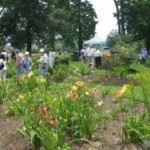 The gardens grew exponentially to 15 beds of 800 cultivars and species by the end of 2011. At some point I started to believe that we could find every Ohio daylily receiving an AHS Honorable Mention, Award of Merit, and Stout Award. Actually, we are close to that goal. 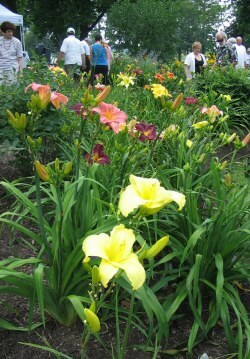 Five beds in the garden showcase award-winning daylilies, including a complete Stout collection. I would like to think that the development of our garden has influenced new hybridizers. Please encourage the 13 men and women who registered their first daylily since 2005 as introduced in my article “From Simple Beginnings” in the Fall 2011 edition of the Region 2/Great Lakes Daylily Newsletter. This spring we hope to add more Ohioans who registered their first plants in 2011. 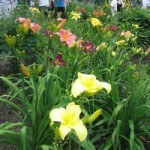 The Steve Moldovan Memorial Daylily Collection evolved following his unexpected death in 2007. Awarded the Bertrand Farr Medal all the way back in 1992, Steve’s career is legendary in hybridizing circles. 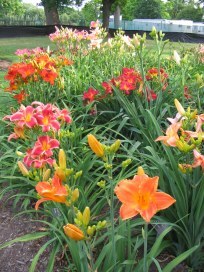 Spanning over 50 years, his work illustrates the best qualities of daylilies that we wish to teach. After his death, Region 2 honored Steve by sponsoring the Steve Moldovan Mentoring Award. In 2010 we transplanted 50 clumps of Moldovan cultivars into a whole new section of the garden. It was an extremely cold and wet spring that year with a lot of work to complete. 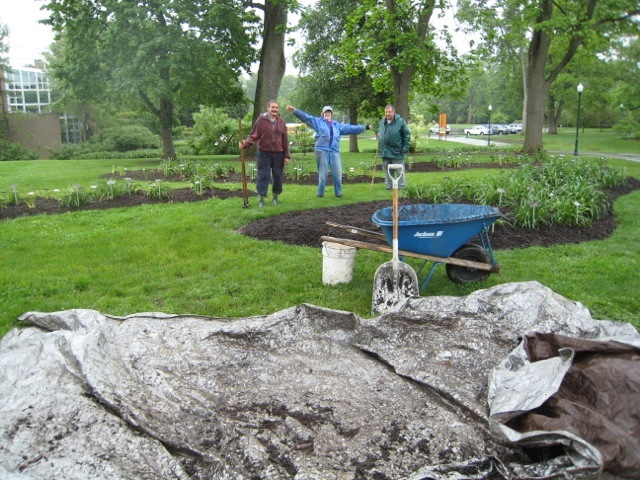 One of my favorite photos that spring was of Alan Hersh, Steve Williams, and the late Jane Saliaris celebrating the completion of mulching the newly planted garden in the rain. That collection also thrived, and by the end of 2011 it numbered over 250 of the 466 registered Moldovan daylilies and is still growing. Through a continuing program to trade northern and southern-bred plants, Steve Moldovan and Bill Munson enhanced the genetics of daylilies that thrive in variable conditions. Steve actively praised the work of younger hybridizers. Mike and Sandy Holmes, Bill Chambers, Roger DeLongchamp, Ted Slanic, and the late Eric Moore invested sweat equity every summer to work with Steve and Roy’s seedling crops. 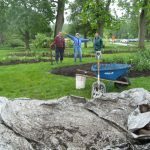 They battled the nearly overwhelming flooding and drainage problems in 2004 and 2005 at Moldovan Gardens in Avon, Ohio when many lined out introductions and 20,000 seedlings were lost. These hybridizers, also represented in our gardens, are continuing outstanding hybridizing work begun in those years. Ultimately, mentoring may be Steve Moldovan’s most important legacy. Many Ohio hybridizers can share Richard Norris’ experience. 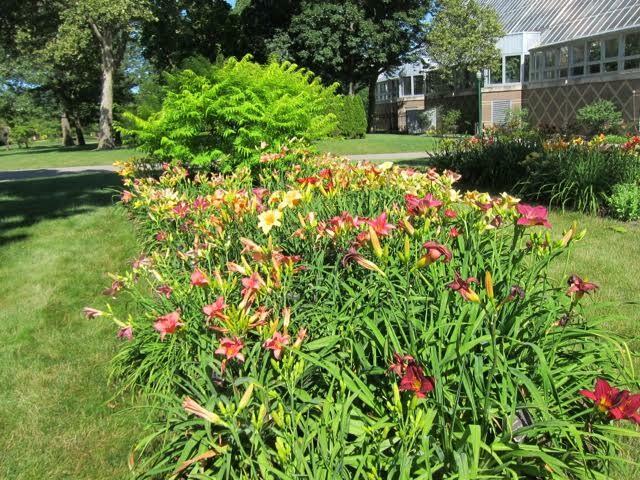 Richard recalls, “During the years of my introduction to daylilies in the late 80’s and early 90’s, I was fortunate to be able to spend many a morning in bloom season with Steve as he hybridized. He patiently explained what he was doing and why. I did my best to be a sponge and absorb everything I could from him. When I asked him a specific question, he would elaborate on his perspectives on whatever I wanted to know. 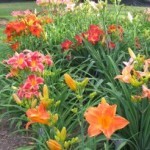 In the course of a few years I was able to learn volumes about daylilies and the daylily world. I can state with a great deal of confidence that I would not be where I am today without the input of Steve Moldovan.” Richard dedicated H. ‘Memorial to Steve’ (Norris, 2008) to his mentor.